Superyacht owner Paola Trifirò takes us on a 7-day journey along Turkey’s stunning Turquoise Coast, from the magic of Istanbul to underwater ruins in Kekova. Few countries in the world have such cultural diversity as Turkey. Although its cities are very much grounded in the modern world, its history and architecture have been influenced by the Byzantine, Ottoman, Roman and Persian empires. Its southwest coast – commonly called the Turquoise coast – shows the strains of recent tourist development, but each town and island has its own magic. There are many must-sees while chartering a yacht in Turkey, whether it be easily accessible ancient ruins, sweeping beaches, quiet anchorages or lovely cafes and restaurants. For health-conscious gastronomes, few cuisines rival that of Turkey. The Greeks and Turks have a centuries-old disagreement over the origins of their similar table fare, which typically features seafood, lamb, fruits, yogurt and olives among many other things. Turkey’s largest city, Istanbul, is a world unto itself with abundant evidence of all the country’s storied past and vibrant present. Plan to spend a few days before or after your cruise to experience the splendours of this world capital. Few leave without a rug or a Turkish kilim purchased in one of the city’s bazaars. Day 1: Istanbul to Marmaris You are likely to start your superyacht charter is Istanbul. From there you’ll take a short flight to Dalaman international airport, which serves southwest Turkey, and meet your yacht. 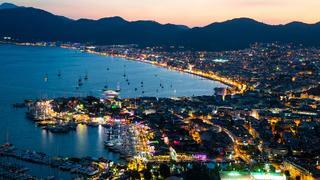 Marmaris is a tourist town extraordinaire. its marina waterfront features a long stretch of outdoor restaurants and its castle and the adjacent old Town are a worthy walk. Superyacht owner Paola Trifirò takes us on a 7-day journey along Turkey’s stunning Turquoise Coast, from the magic of Istanbul to underwater ruins in Kekova. Few countries in the world have such cultural diversity as Turkey. Although its cities are very much grounded in the modern world, its history and architecture have been influenced by the Byzantine, Ottoman, Roman and Persian empires. Its southwest coast – commonly called the Turquoise coast – shows the strains of recent tourist development, but each town and island has its own magic. There are many must-sees while chartering a yacht in Turkey, whether it be easily accessible ancient ruins, sweeping beaches, quiet anchorages or lovely cafes and restaurants. For health-conscious gastronomes, few cuisines rival that of Turkey. The Greeks and Turks have a centuries-old disagreement over the origins of their similar table fare, which typically features seafood, lamb, fruits, yogurt and olives among many other things. Turkey’s largest city, Istanbul, is a world unto itself with abundant evidence of all the country’s storied past and vibrant present. Plan to spend a few days before or after your cruise to experience the splendours of this world capital. Few leave without a rug or a Turkish kilim purchased in one of the city’s bazaars. 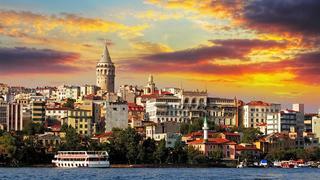 You are likely to start your superyacht charter is Istanbul. From there you’ll take a short flight to Dalaman international airport, which serves southwest Turkey, and meet your yacht. Marmaris is a tourist town extraordinaire. its marina waterfront features a long stretch of outdoor restaurants and its castle and the adjacent old Town are a worthy walk. From the bustle of Marmaris, you’ll enter the serenity of Ekincik, which is in a nature conservation area. The Sultaniye Spas thermal baths are just a few minutes taxi ride from this small town’s waterfront. Your crew can take you by tender to Caunos on the Dalyan river to admire the ancient ruins and rupestrian tombs. En route to Fethiye, a swim and lunch on Tersane island and a visit to Manastir (Cleopatra Bay) are a must. Fethiye sits atop Telmessos, the ancient capital of the lycian coast. 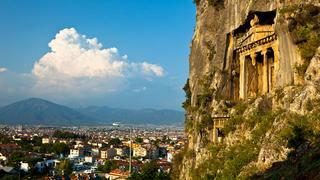 in and about the city are numerous historic sites, including many lycian tombs and sarcophagi. Don’t miss the fish market in the old city. 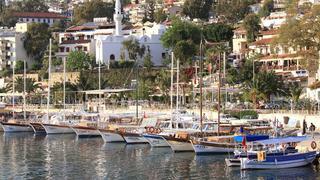 Once a modest village, Gocek is now rich in activity with many hotels, shopping and restaurants. like Marmaris, it is a yachting center. a group of five islands off Gocek called the Yassica Adalari provide scenic anchorages for a quiet overnight. Kalkan is a delicious village scrambled up a hillside that is rich in flowers and restaurants. 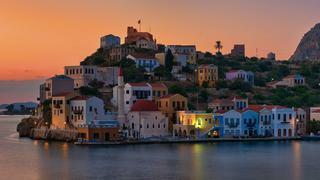 The town has taken special care to preserve its ottoman and Greek architecture. as a result, its old town and new development live in better harmony than in some coastal areas. You’ll overnight in the new Kas Marina 12 miles away. After enjoying the shops and steep streets of the picturesque fishing village of Kas, or the hellenistic theater ruin just outside town, board a local boat for a half-day visit to Kastellorizo, a splendid Greek village offshore. 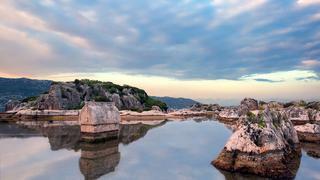 In the evening, cruise to Kekova. Visiting Kekova is astonishing. With local boats, you can explore the underwater ruins of an ancient city, admire tombs emerging from the sea and more. Or spend your day ashore in a colorful restaurant where you sit on Turkish carpets and sip Turkish coffee.